What even high-flying auto towns in Germany and China can learn from the lessons of Detroit, and what the Motor City can learn from how other cities have successfully reinvented themselves. 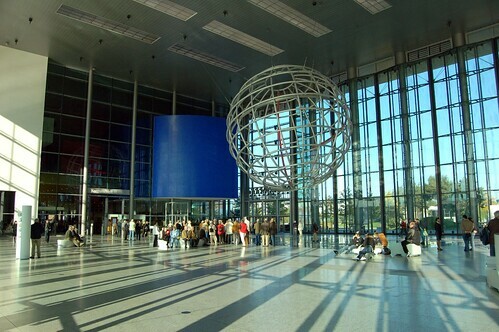 Volkswagen’s Autostadt complex in Wolfsburg, Germany. Photo by ilovebutter. Buy a new Volkswagen in northern Germany and you probably won’t go to a dealership to pick it up. You visit a theme park called Autostadt in Volkswagen’s hometown, where there are rides, dining, museums, celebrations of auto design and a final stop to pick up your car fresh from the city’s factory. The brash promotion and family fun frames an automotive city at the top of its game. It recalls Detroit or Flint 40 years ago before deindustrialization and competition turned them into bywords for decline. Like Wolfsburg and Detroit, the world’s uber-automotive city, there are car capitals around the globe at various stages of ascension and decline. The Free Press attended a three-day conference in Wolfsburg last month that looked at these automotive cities, trying to understand common themes of boom to bust and possible remedies. What can the world teach Detroit about surviving the harsh downside of an industrial life cycle? Can that life cycle be reversed? Chrysler owner Fiat’s home, Turin, Italy, lost much of its auto industry a generation ago but has been reinventing itself in various ways. It hosted the 2006 Winter Olympic Games. It has embarked on a major greening of the city’s former industrial sites. It has developed a niche as a television and movie center in Italy. China, in its centralized fashion, hired a famed German architect to rebuild several of its cities as modern planning jewels to deal with overpopulation and traffic ills from too much success on the boom side. Chinese bureaucracy has slowed that process. Detroit, for its part, promotes a burgeoning downtown tech corridor, planned mass transit along Woodward Avenue, a growing arts and entrepreneurial spirit in Midtown. Like most places, Detroit and Michigan desperately want to attract other industries to diversify the economic base. But does any of that introspection and reinvention work? The record around the globe seems to hint that automotive cities live so well during boom years that they don’t bother to diversify until faced by a crisis. And if an automotive capital like Turin, which closely resembles Detroit in population, has successfully overcome its losses, cities like Detroit and Flint and Russelsheim are still trying to figure out their next steps. Yet there are nonautomotive cities that have transitioned well after losing their signature industry. Pittsburgh gets generally high marks for moving from a steel capital to a city built on education, health care and other knowledge industries. Martina Hessler, a professor at Helmut Schmidt University in Hamburg, Germany, said she organized the conference to see how automotive cities deal with problems of unemployment, social polarization and loss of tax revenue from the carmakers. Studying them reveals a life cycle of boom and bust. But unlike historic gold rush cities that died quickly, auto companies and their owners build hospitals and schools, sponsor sports teams, support local charities. Production workers and their families take pride in producing such an iconic product. There are, of course, plenty of unanswered questions. “Why does a theme park (like) the Autostadt work in Wolfsburg, but not in Russelsheim or Flint?” Hessler said, referring to Flint’s doomed AutoWorld park, which opened in 1984 and immediately flopped. Then, too, whether other automotive cities suffer to the same extent as Detroit and Flint remains an open question. Hessler noted that U.S. cities also suffer a high degree of suburbanization, which drains population out of a city perhaps as much or more as industrial loss. Europeans, however, support their central cities more and so may bear up to industrial losses better. Another potential stressor: Will people actually drive cars in the future the same way they do now? Climate change and global warming may force a greater reliance on public transit. Those trends could spell changes for even the world’s most comfortable automotive cities. “Even automotive cities (like) Wolfsburg, which are living very well now, should be prepared for crisis and structural changes,” Hessler said. A theme that emerged from the conference was that auto cities tend to trace similar paths over time. There is the early boom, as production soars and immigrants flood into the new auto city for high wages, (think Detroit circa 1915). Then follows decades of prosperity. Eventually, automation, foreign competition, or other challenges sap the work out of an auto city, leading to social breakdown and rising poverty. Newer boom towns in China like Changchun and the Anting district of Shanghai are just beginning the ride up the curve as China’s automotive market soars. Mature cities either enjoy their prosperity, as in Wolfsburg, or are dealing with the first stirrings of decline, like Toyota City in Japan. And some automotive cities are far down the slope where de-industrialization and other ills have drained away workers and evaporated the lush pay and benefits that made them famous. Detroit and Flint symbolize those. Clearly communities enjoy a bounty of benefits in the early phases of the life cycle, just as Detroit saw its population soar from 300,000 in 1900 to an estimated 1.85 million in 1950. But the down slope can prove especially painful, as automotive families in Detroit and Flint know all too well. Kurt Roder, head of business and urban development for the City of Russelsheim, said the city government is deeply in debt as Opel’s fortunes have declined. And with Opel owner General Motors possibly planning more cutbacks, the German city may suffer even more. Russelsheim hopes its push to become a “City of Knowledge,” less dependent on automotive production employment, will be successful. In much the same way, Detroit and Flint have tried to encourage a more entrepreneurial economy, nurturing start-ups in digital software and other fields. Half a world away, Chinese leaders hired noted German architect Albert Speer, son of the infamous Nazi architect of the same name, to design model cities for them in Anting and Changchun. Speer showed slides of his plans, which include model cities with rows of gleaming skyscrapers, as well as parks, lakes, universities, motorways and production facilities. But Speer admitted that building out these grand visions has been limited so far because of Chinese bureaucracy. “It’s a big adventure and a big challenge,” Speer said. Wolfsburg offers a glimpse at an automotive city in its prime. Founded by the Nazis in 1938 to produce the “people’s car” demanded by Hitler, the town of Wolfsburg has weathered various storms over the decades to stand today as a city of about 120,000 residents, almost all of whom depend on Volkswagen directly or indirectly. Volkswagen provides virtually everything in Wolfsburg, from employing about 50,000 workers to sponsoring the local soccer team and building the local stadium. So tied to its image as VW’s home, Wolfsburg has little other identity. Any notion that Wolfsburg may falter one day was met with staunch denials by local officials at the conference. Julius von Ingelheim, a spokesman for the city, told the conference that about 10 years ago, Wolfsburg worried about becoming the next Detroit, a city in decline. But he added that the city felt it had met those challenges and that decline was by no means inevitable. But Hans-Joachim Braun, an authority on the history of technology at Helmut Schmidt University in Hamburg, said Wolfsburg may be too optimistic.